Brother Australia has announced a new solution for its Brother GT-3 printer – the AccuLine Camera System. “This sophisticated yet easy-to-use system works with a full HD, 13 MB pixel digital camera to get the right print placement within less than 1mm of error,” Greg Benardos, Brother channel manager – DTG and New Technologies, said. Standing above the printer, the AccuLine Camera System allows users the ability to precisely print on smaller areas such as a pocket to a maximum space of 16” x 18”. The system is also not limited to substrates and can easily align designs on shoes, caps, shirts, coasters, and more. Brother has been in the garment decorating industry since 1908 and has become a leading supplier of industrial garment printers. Brother utilises a fully-integrated system by manufacturing its own firmware, print heads, and software to deliver the best possible results. 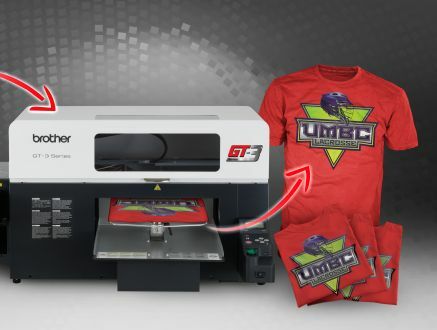 The Brother GT-3 Series of digital garment printers consists of an initial line-up of three modular models allowing buyers to upgrade as their business grows. This series of three machines offers a CMYK-only printer, a CMYK with two white print heads and a CMYK with four white print heads for higher speed and performance. “The technology and reliability of these models stem from our success with previous GT series and our extensive range of domestic and commercial printers,” Bernardos said. “Brother's experience of printing technology is merged with our experience in commercial development by manufacturing the printer, print heads, ink, and software development, to insure a fully-integrated system, versus many competitors who use existing domestic parts and re-manufacture of commercial machines to develop garment printers."